Drought in Nepal affects 67,180 hectares. Poverty incidence in its uplands is at an alarming 68%. The rice-wheat cropping system, which is dominant in sodic soils and the world’s most important cropping sequence, is practiced in 28% of Nepal’s total rice area. In the Churia Hills, cowpea, maize, and peanut are intercropped with upland rice. Farmers here also rotate legumes with upland rice. In the western midhill uplands of Nepal, farmers rotate upland rice with vegetables where irrigation is present in early summer or the summer season. Drought. Varieties released. Drought-tolerant rice variety Ghaiya-1 (IR44595-70) was released in 2010 as part of a strategy to ensure household food security and environmental sustainability in upland Nepal. Working Group 1 conducted two mother trials, one in upland rice (direct seeding) and the other on drought-tolerant rice (transplanting) in four project districts and 11 project villages. Thirteen rice varieties were validated: Sookhadhan1 and Sookha dhan2, Radha4, Hardinath1, Tarahara1, Ghaiya-1, IR554355, and Pakhejhinuwa for upland and rainfed lowland; Loktantra and Makwanpur1 for rainfed lowland; and Sunaolo sugandha, Ramdhan, and Sabitri for irrigated lowland. Mother trial on upland rice. A mother trial for upland rice was conducted in Purkot Village, Tanahun District. Preference ranking. Thirty-six farmers (16 males and 20 females) were involved in the preference ranking program. Mother trial on lowland rice (set I). This trial was conducted in the rainfed lowland area of Mr. Ram Krishna Pokhrel at Sundarbazar-8, Lamjung, during the wet season of 2012. Phenological and growth characters. Most of the hill farmers prefer early-maturing varieties for intensive farming. Mother trial on drought-tolerant rice (set II).This mother trial was conducted in Ms. Kali Maya’s field under rainfed lowland conditions at Bhanu VDC-8, Chambus, Tanahun District. Varietal demonstration on lowland rice. Eight genotypes were included in the paddy demonstration program. Uplands. Rice varieties for the uplands. General accomplishments of Nepal include three evaluations of appropriate cultivars using 91 lines, 13 participatory varietal selections with 107 varieties tested, 15 management trials, and 36 varietal/field trials. In particular, partners from the National Rice Research Program (NRRP) tested 12 elite lines from IRRI, including check variety Radha-4 in an advanced yield trial. Participatory varietal selection (PVS) in rainfed lowland. Three PVS trials on rainfed lowland-medium were conducted on-farm under bunded upland conditions in Patu Village. Aerobic conditions. Another five sets of upland CFFT trials were conducted in five farmers’ fields to identify high-yielding varieties under aerobic conditions at the CURE sites. Irrigated lowlands. Farmers need new varieties with higher productivity than Sabitri, the variety commonly grown from June to October. Rainfed conditions.Baby trials conducted in Bhapasi and Patu villages involved 22 farmers’ fields at each location. Crop management. Planting short-/long-duration leguminous crops together with upland rice not only reduces the risk of crop failure but also improves soil fertility. Field days. A field day was organized in Patu and Bhapasi villages to acquaint the farmers with the ongoing activities at the sites and to discuss their problems related to agricultural production technologies. Community-based seed bank. 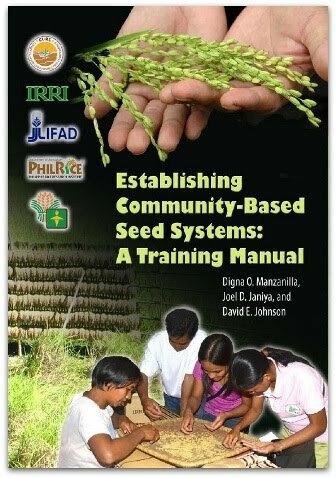 Community-based seed production resulted in access to rice seeds for resource-poor farmers who are not able to save seed. Crop combinations that can be grown with rice. Hardinath-2 was tested in five farmers’ fields as replications with three crop combinations—rice + groundnut, rice + maize, and rice + cowpea—under farmer-managed conditions in uplands in Bhapasi. Crop rotational trial in rainfed upland. Rice variety Ghaiya-1 was seeded with three rotations, rice-lentil, rice-mustard, and rice-chickpea. Weed management. Different weed management practices were evaluated to identify better options. Intervention of early-season winter vegetables (August-Sept. transplanting). Vegetables such ascauliflower, cabbage, broadleaf mustard, tomato, radish, carrot, etc., were planted during Aug-Sept and are considered as early-season winter vegetables since they are normally grown during Oct-Nov. Intervention of normal-season winter vegetable crops (November transplanting). Farmers normally grow normal-season vegetables in their kitchen gardens. Intervention of off-season summer vegetables (cucurbits). Traditionally, cucurbitaceous crops are grown in the summer season in the mid-hills of Nepal. The forcing of cucurbits (growing of cucurbit seedlings in a poly tunnel) is a newly developed technology for off-season production. Crop combinations that can be grown with rice. 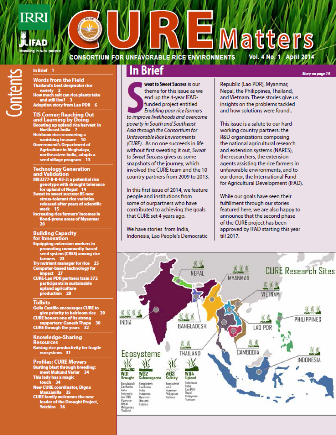 Monocropping of rice is risky due to drought during critical crop growth stages. The cultivation of short-/long-duration leguminous crops in combination with upland rice not only reduces the risk of crop failure but also improves soil fertility.